If you've read my post on how to have Android geo tag photos, this one may be useful on how to see the tags and photo location in OSX. Open the picture in Preview on OSX 10.5, and do apple-I, or from the Tools Menu select "Get Info". 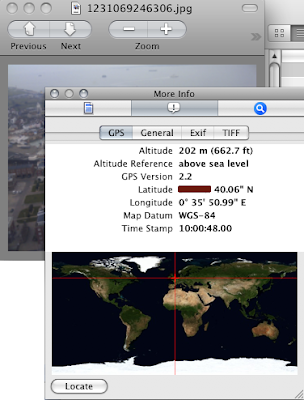 The info window opens, click the middle tab, and if the photo has geo EXIF data you'll see the 'GPS' tab.